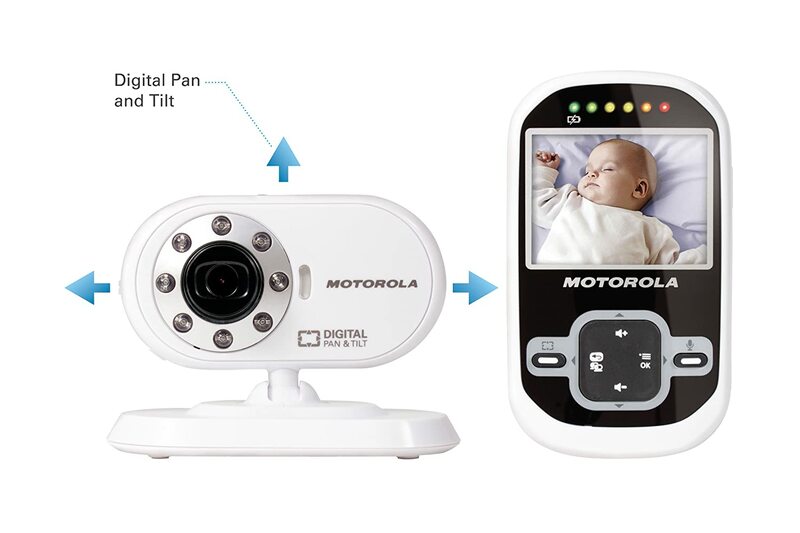 I am pleased to have Annie back to share her review of the Motorola MBP26 Wireless 2.4 GHz Video Baby Monitor with 2.4" Color LCD Screen, Infrared Night Vision and Remote Camera Pan and Tilt that she is using to help monitor her two sweet children! Motorola's MBP26 Video Baby Monitor will give you the reassurance that your child is resting peacefully. Its 2.4GHz FHSS technology gives you peace of mind in knowing that its digital signal communication is secure so others cannot eavesdrop. It also ensures that it will remain free of interference from other wireless electronic devices commonly used around the home. With Motorola’s MBP26 you're sure to hear every peep. Equipped with 2.4GHz FHSS technology for sound clarity, you can feel comfortable your little one will come through loud and clear when they need you. A 2.4" LCD color display shows sound and video monitoring, with infrared night vision. The MBP26 digital audio baby monitor has an impressive range of up to 520 ft with an out of range warning, allowing you to move around the house or yard comfortably, knowing you will hear when your little one is awake. The 2.4GHz FHSS technology offers a more reliable wireless connection over previous cordless technologies such as 900MHz cordless antennas. That means better range and less chance of missing something important in your baby's room due to a weak or dropped signal. A full-color 2.4" LCD display shows real-time video and sound in your baby's room with up to 25 FPS video playback, keeping you informed of what's going on visually as well as audibly. Infrared night vision means you can stay in touch with what's going in your baby's room without any lights to disturb little sleepers. The superior wireless range of the MBP26 lets you keep connected to your baby up to 520 feet away. So even if you have a larger home, you don't have to give up safety or the ability to stay connected to your little one. An alarm sounds when you're getting out of range of the transmitting unit, so you'll never have to wonder if you're close enough to hear what's going on. I sat and looked at the box for this video monitor for a few weeks before actually opening it. My wonderful husband had informed me that he wouldn’t be helping me set it up, so I was a bit intimidated. When I finally decided to tackle the task, I couldn’t believe I had waited! The setup was a breeze. There are two plugs, a camera, and a viewing/listening device. The plugs have a drawing of the part they fit with right on the plug, so there’s no second guessing. The cords are also REALLY long, so you can mount the camera where you need it, not just where the outlet is located in the room. The camera is turned on and off via a switch on the moveable camera itself, while the receiver has a push button. I personally like to turn the camera off when not in use (for security reasons), and flipping that switch without repositioning the camera is nearly impossible. I would have liked to see the switch on the base rather than the moveable camera portion. The viewing/listening device works either plugged in or on battery backup. While running on battery, the video turns off after a short period of time. You have to push a button to turn it back on, it doesn’t automatically turn back on when movement or sound are picked up from the camera. If it’s the video you really want, I’d suggest leaving plugged in because I’m constantly pushing the button to see my baby again. The monitor also is equipped with two-way communication so you can try to calm baby with your voice, too. The sound and video quality for this monitor is great. This monitor does not pick up any static or interference from our son’s monitor, and there’s a multi-color light indicator that changes according to how loud baby is (grunts vs cries), even if you have the sound turned down. The video picture is in color when the lights are on in a room and black and white when the lights are out. Even in the pitch black, I could easily see my daughter sleeping.